The truth has finally come out: I’m not much of a sports fan. So this week, when a colleague invited me to participate in a fantasy football league, I had to decline on the basis of complete ignorance . Unless we’re talking about gadget news —the sport of kings—I’m about as useful as a Bluetooth chip on a toaster oven. In a lead-lined room. Anyway, batting leadoff in Gadgetbox’s lineup this week: Sirius’s new portable radio, which may finally live up to its name; in the number two spot, it’s beefing up your household security to airport levels; and in third place, we’ll show you how to harness nostalgia for the perfect present … for me! While I’d presume that most of our audience is comprised of iPod users, I’m sure that there are a few people out there who choose to enjoy their music from other sources, like satellites orbiting high above the Earth’s atmosphere. If you’re one of those folks, you might be interested in Sirius’s revamped version of their portable Stiletto player. The original Stiletto had its fair share of shortcomings, predominantly a bulky design, dependance on a proprietary headphone connector, and poor reception. Sirius has fixed at least some of those issues with the Stiletto 2. The design might look the same, but they’ve shaved off quite a bit of the excess, claiming that it’s 25% smaller and lighter, as well as added a couple of new features, most notably a microSD memory card slot which can be used to expand the player’s storage up to 2GB. Like the original, the new version still runs for $350, in addition to your monthly subscription fees for Sirius. That still seems a little on the expensive side to me, but until there’s a satellite radio add-on for the iPhone or iPod, it appears that this may be the best option for those who need their fix. Every time I go to the airport, I have the same thought: why don’t I have this kind of security in my own home? Instead, I just have a simple tumble lock that—let’s be honest, here—isn’t going to stand up to a firm kick, much less a guy with a crowbar. But that’s really the least of my worries. What about the people I do let in? If there’s one thing I’ve learned it’s that everybody is a security risk: pizza delivery people, Girl Scouts, even my Uncle Albert. If you really want safety, you’ve got to be prepared to spend some cash. Let’s say in the ballpark of $43,000. You see, the Scan25 Letter/Parcel/Bag Screening machine is just the solution for my problems. By using this “ex-ray scanner,” I can easily check to see if that delicious pizza pie in fact contains a dirty bomb, or if little Suzy’s seemingly innocent backpack conceals a disassembled sniper rifle. You can’t be too careful. Just hit the button and an image of a parcel’s contents appears on the 17” LCD screen, which, if the picture is to be believed, is cleverly hidden inside a CRT monitor. Between this and my long-standing policy of making all guests take their shoes off, I’m well on my way to a totally secure environment. If only my roommates would stop leaving the back door open. I know exactly what you’ll be thinking when I remind you that it’s only two months and thirteen days until my half birthday. “Good lord, I haven’t gotten him a present yet.” Relax: there’s still plenty of time to find something. 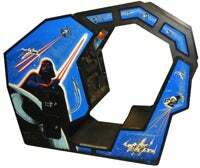 But as long as we’re here, may I nudge you in the direction of this original Star Wars arcade game ? Okay, at $7,000, it may seem a tad steep, but hey: have I ever asked you for anything before? Here I am, providing you with this incredibly valuable information week in, week out, demanding nothing in return but your smiles and undying appreciation. Is one teensy-weensy little video game too much to ask? I mean, we’re talking an original 1983 sit-down arcade game, just like the one they used to have in the amusement park I went to every summer when I was a kid. Look, it’s the closest I’ll ever get to flying a real X-Wing fighter. Can you really take that away from me? I’m sure if you each throw a dollar in the hat, we could have one by my half-birthday. In 2072 or so. And so, like all good things, this week’s edition of Gadgetbox draws to a close. We’ll be back next week, and don’t forget to drop a dollar in the old virtual tip jar to help move me one step closer to my dream of destroying the Death Star. I totally promise to give you all free plays.